Bryan Gaensler receives funding from the Australian Research Council and from the New South Wales State Government's Science Leveraging Fund. Magnetars are stars that are incredibly dense, rapidly spinning, amazingly hot and – as their name suggests – are the most magnetic objects known in the universe. The magnetic field on the surface of a magnetar is 100 trillion times stronger than that here on Earth. Now a team of astronomers led by Simon Clark at The Open University in the United Kingdom might have finally figured out how magnetars are formed. Their findings are published in the journal Astronomy and Astrophysics today. Magnetars are an extremely rare and exotic breed of star. Of the hundreds of billions of stars in our Milky Way, there are fewer than 25 known magnetars. These extraordinary objects push the limits of our theories of physics. So how do they form? Clark’s research involved some spectacularly painstaking forensics using one of the world’s largest telescopes, the European Southern Observatory’s aptly named Very Large Telescope. Magnetars are a special type of neutron star – the collapsed dense cores left behind when massive stars die in supernova explosions. But there’s a fundamental problem with this basic statement: why do supernova explosions usually tend to make “normal” neutron stars and only very occasionally produce magnetars? Clark and his team focussed their attention on a young magnetar with the not-so-poetic name CXO J164710.2-455216. Located about 16,000 light years away in the southern constellation Ara (the Altar), this magnetar is only a few thousand years old and still sits within the same cluster of bright stars where it originally formed. While the magnetar can’t say how it got there, its neighbours can be interviewed to see if there were any witnesses to the supernova explosion that created it. Like a detective individually questioning all the witnesses to a crime, the astronomers used the Very Large Telescope to extract chemical fingerprints for more than 100 stars within the cluster. The light from each of these stars is incredibly feeble, but this powerful telescope can isolate that starlight and also split it up into a spectrum of colours to help determine its precise chemical composition. The project has been running for six years, and gathering and then analysing these data has been an exhausting task. But now with the survey complete, one star’s testimony is worthy of further investigation. The star that the team zeroed in on is known as Westerlund 1-5. 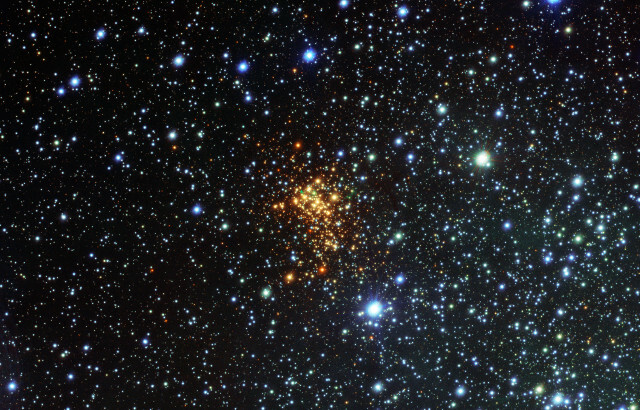 Like many of the stars in this cluster, it is much more massive than our sun and thousands of times larger and brighter. But it also appears to be hiding something. Westerlund 1-5 is sooty – its spectrum shows that it has been dusted with carbon. This isn’t too surprising and can often happen if the star has a companion. Most large stars are found in binary systems. If the two stars orbit each other closely, one star can drench the other with layers of its own gas. But Westerlund 1-5 is curiously alone. What’s more, the data from the Very Large Telescope show that the light from Westerlund 1-5 is Doppler shifted. This implies that the star is moving away from the rest of the star cluster at more than 200,000 kilometres per hour. Could something have given the star a massive shove? Clark and his team proposed exactly what’s needed to make all the pieces fit. The only explanation that makes sense is that the magnetar CXO J164710.2-455216 and the star Westerlund 1-5 were once a binary couple. The magnetar’s progenitor sprayed carbon all over its companion and then blew up as a supernova. This violent explosion broke the gravitational ties between the two stars, sending them flying apart at high speed. This discovery is new and exciting, because it gives us a vital clue as to what makes a magnetar. It’s been proposed that one way to create the extreme magnetism of a magnetar is to get the star spinning very quickly right before it explodes. Like a dynamo, this winds up electrical currents and generates intense magnetism. The problem is that calculations and computer simulations simply can’t reproduce the fast rotation speeds needed for this to work. But a very nearby binary companion, one that collects up the outer layers of the dying star, will also help the star spin faster and faster. This can then create the super-strong magnetic fields of a magnetar. So, if you’re a dying star destined for a supernova explosion, having the right partner might be just the environment you need to become a magnetar. This detective story is a masterpiece of careful analysis, a needle-in-a-haystack effort that may have cracked one of the long-standing mysteries of the cosmos. But like all good discoveries in astronomy, this breakthrough raises as many questions as it answers. Were the other known magnetars formed in the same way? Can even stranger objects sometimes form, in other types of weird binary systems? What’s certain is that the universe will continue to amaze and surprise us.